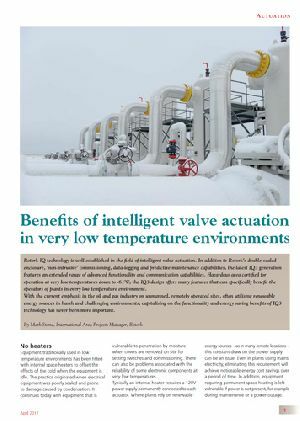 Rotork IQ technology is well established in the field of intelligent valve actuation. In addition to Rotork’s double-sealed enclosure, ‘non-intrusive’ commissioning, data-logging and predictive maintenance capabilities, the latest IQ3 generation features an extended range of advanced functionality and communication capabilities. Hazardous area certified for operation at very low temperatures down to -61ºC, the IQ3 design offers many features that can specifically benefit the operators of plants in every low temperature environment. With the current emphasis in the oil and gas industry on unmanned, remotely operated sites, often utilising renewable energy sources in harsh and challenging environments, capitalising on the functionality and energy saving benefits of IQ3 technology has never been more important.